The walnut handled tamper is pure luxury. Each wood handle is crafted by Paul in-house and is carefully sanded, oiled and buffed to a silky smooth finish, a process that takes several days. The results are simply exquisite. The base is a different shape to our other tampers and made from a different grade of stainless steel. WoodThis is our new very high quality basic and economical espresso tamper. The handle is made from Rubber Wood, which is commonly used for a lot of wooden children's toys and other kitchen utensils. It is then given a durable lacquer finish. We also chose rubber wood because it is made from sustainable rubber trees. ​Handle is made from a solid bar of high grade aluminium, CNC turned and then expertly given a very fine brushed finish. A lighter wood that produces some real gems that are just gorgeous. The least dense of all the woods. 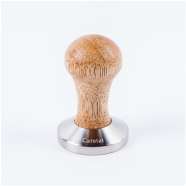 The Espresso Premium tamper featuring a combination of different materials - in this case the middle section is a luxury walnut wood whilst the crown part is made from aluminium with a satin brushed finish. Like the Espresso Walnut Wood tamper, each wood handle is crafted by Paul in-house and is carefully sanded, oiled and buffed to a silky smooth finish, a process that takes several days. The results are simply exquisite. This is the result of having a professional designer look at the tamper design from the ground up. Available in 53mm Flat, 58mm Flat, 58mm Convex and VST 58.5mm Flat.